Bengaluru was then under the rule of Vijayanagar king and Kempegowda-I (1513-1569), was controlling the territory with Yelahanka as the base. He had seen the advantages of shifting the head quarters to Bengaluru from Yelahanka hence planned a proper town with fort as the nucleus. It is customary that new towns used to be built by the rulers on the banks of some river and Bengaluru is no exception. Bengaluru was also built on the banks of the river Vrishabhavathi and Paschmavahini. The river Virshabhavathi forms the western boundary of the then Bengaluru. With the permission of Vijayanagar King Achutharaya, who also sanctioned financial grant for the new city, work started. In the year 1527 he had built the new capital Bengaluru as per the plan. The modern town had almost all you can think of [even today it is a stand alone city]. The town was planned to have cantonment, temples, tanks and market place for all trade and professional activity. The fort was built of mud with moat surrounding the fort. The areas inside the city was divided and demarcated as districts according to the activity. Every district was known by their activity. ‘Pet’ refers to “Pete” which in Kannada is the colloquial equivalent for a business district. Chicka means small, and Chickpet was for small business, dodda means big and Daddapet was for big business. Nagarthapet for jewelers, kumbarapet for potters, and Akkipete, Cottonpete, Ragipete, Balepete were for trading the respective commodities. Agraharas were residential places for priest and celebrants. Even today the main whole sale market for Bengaluru remains in these localities only. The town had two main streets: Chickkapete Street ran east-west and Doddapete Street ran north-south. Their intersection formed Doddapete square — the heart of the then Bengaluru. Kempe Gowda's successor, Kempe Gowda II, built temples, tanks including Kempapura and Karanjikere tanks and four watching towers that marked Bengaluru's boundary. The town thus built by Kempe Gowdas had as many as nine gates for the fort city. Every gate of the city was named after the place to which the way will lead. The four main gates were Halasoor [Ulsoor] for east, Sondekoppa for west, Yelahanka for north, and Anekal for south. Others were Varthur, Sarjapur, Kanakanahalli, Kengeri, and Yeshwantapura gates. The gate which lead to Yelahanka [old capital of Kempe Gowda] is known as Yelahanka gate which is in the one end of [Doddapete] Street. British renamed this street as Avenue Road. The Yelahanka Gate was there where today the Kempe Gowda road and Avenue Road meets. The circle is more popularly known as Mysore Bank circle because of the Mysore Bank [presently State Bank of Mysore] building nearby. But the Sri Anjaneya Temple built by then rulers still reminds one about this place as “Yelahanka gate”. 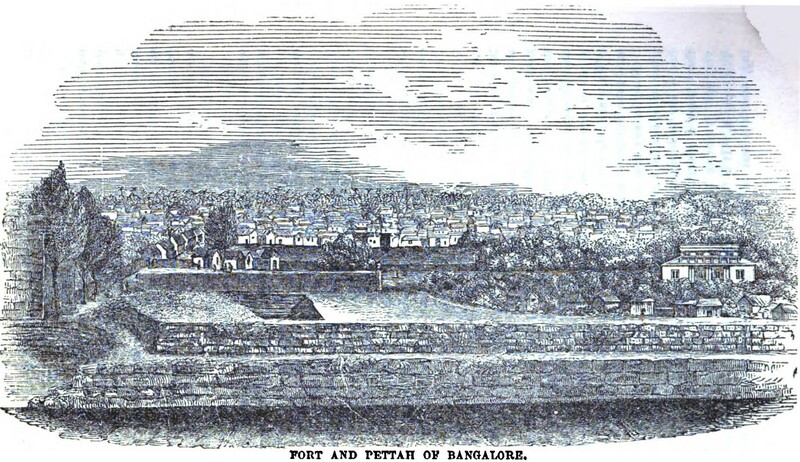 In accordance with the Vastu, the town of Bengaluru was conceived and executed. It had a water tank Dharmambudhi at the North West of the town [which is now central bus terminus] and the grama devata Sri Annemma [near Kapali theatre]. It is customary of the rulers of Vijayanagar to build a temple for Sri Anjaneya at entrance of the fort and also at the entrance of their province. Bengaluru is no exception to this and when the town was planned it had Gali Sri Anjaneya temple at the western boundary of the town. The North entrance of the town was Yelahanka Gate. A temple for Lord Anjaneya had been built as protector of the Bengaluru province. Probably since the town of Bengaluru was built in accordance with Vastu, even today the town had not lost its glory. The temple is very simple.It has three sannadhi and the main sannadhi is Sri Anjaneya Swamy. One can have darshan of Sri Narayana along with Mahalakshmi on to the left sannadhi and dharshan of Mahalakshmi on the right sannadhi. Sri Anjaneya Swamy of this temple is facing north east [esanya] in ardha shila form. The vigraha is about three feet in height. The Lord’s has His left foot forward symbolising warning to the enemy army [chatru samharam]. His right leg is seen in a ready to move posture. His ankles have ‘thandai’. Lord’s hip is adorned by ‘kati sutra’ and ‘urudama’ [kacham] his thigh. Lords upavita across the chest is a symbol of the Brihmacharya. His left hand is resting on the left hip and holding gadha which is in raised position as ‘prayoga’ posture. Lords’ right hand is seen raised above his shoulder and showing ‘abhya mudra’. The tail of the Lord is seen raised above his head in the ‘pranava’ formation and a small bell could be seen in the end of the tail. In His upper arm He is wearing ‘bahuvalaya’ and in his wrist he is wearing kankana. Lord’s chest is adorned with three haras [necklaces]. Lord’s sika is neatly tied. He has a ‘kora pel’ [projected teeth]. An enemy will see the Lord as if He is ready to vanquish him. While it is true for the enemy, for His devotees all these will give confidence that he will be protected from the enemy. It will be all the more confirmed by those eyes which are showering karuna. Mere dharshan of those eyes are sufficient for the devotee to gain confidence and move towards his goal. Dharshan of the protector of Bengaluru Sri Anjaneya Swamy at Yelahanka gate will give compound confidence to the devotee to move in the right direction.